It's finder's keepers at the Crater of Diamonds State Park in Murfreesboro, Arkansas. North America's only diamond mine open to the public. Hot Springs National Park. People have used the hot springs here for more than two hundred years to treat illnesses and to relax. One of every five Confederate casualties at the Battle of Shiloh in Tennessee on April 6-7, 1862, was from Arkansas. Visitors are amused by some of Arkansas's colorful place names such as Hogeye, Greasy Corner, Ink, Snowball, Romance, Apt, and Smackover, others are attempting to learn and record how communities and landmarks received their identities. Arkansas is located in the southern, warmer region of the United States, and its name was derived from the Quapaw Indians. It is bordered by six other states, Missouri, Tennessee, Mississippi, Louisiana, Texas, Oklahoma, and its eastern border is primarily made up of the Mississippi river. The state is filled with an abundance of diverse geographical features including mountains and lowlands. Arkansas is recognized as the 29th ranked most extensive state and the 32nd most populated state in the U.S. The state capital, Little Rock, is also the most populated city within the state and is located in the central region of the state. In addition to the mountainous regions and lowlands along the Mississippi river, Arkansas is full of many cave systems, such as the Blanchard Springs Caverns. The state has also identified over 43,000 Native American sites used for hunting, took construction, and shelter, burial mounds and more. Arkansas is also known to be the only state in the country in which diamonds are still actively mined, but not by commercial means, it is mined only by citizens with homemade mining equipment. The climate in Arkansas is typically a humid subtropical climate. Since the state lies within close proximity to the Gulf of Mexico, it is largely influenced it terms of weather. The state is known to experience extreme weather, where in a typical year there will be numerous tornados, hurricanes, hail storms, thunderstorms, snow, and ice storms. The state is documented to receive roughly 60 days of thunderstorms each year and a few of the most devastating tornados were also in Arkansas. 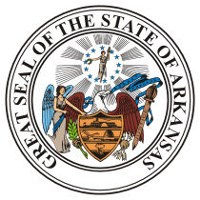 Arkansas was not admitted as a state until June 15th, 1836 as the 25th state. At this time, the state was in the slave labor era with a large cotton culture in the eastern regions of the Mississippi Delta. Today the state has a population of roughly 3 million and is known as “The Natural State”. Arkansas is widely known for its agricultural industry today, however a wide variety of industries are prevalent within the state. Whether it’s the unique climate, the scenic landscape, or the Mississippi river delta, many people visit Arkansas each year to enjoy what it has to offer. The first European to reach Arkansas was the Spanish explorer Hernando de Soto at the end of the 16th century. 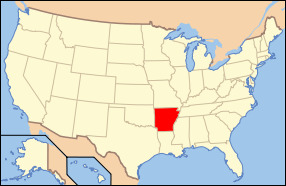 Arkansas is one of several U.S. states formed from the territory purchased from Napoleon Bonaparte in the Louisiana Purchase.